1. (+) Violet, the protagonist - Violet is an unusual protagonist. I have a passage for you that shows you what I mean: (90) "I was the best pickpocket this side of London Bridge, I made an excellent plum pudding, and I knew how to string flowers on thread so they looked as if they were floating. And apparently, I now saw ghosts and heard voices. / I didn't think those would count as pleasurable pursuits." She also reads on her own and doesn't let the snobbishness of the upper class people her mother tends to favor affect her attitude much; she still goes all out to discover who murdered Rowena. Of course Rowena is the one haunting her so maybe there isn't much of a choice in that... but with that, and empathizing with Violet given how she's trapped in a web of lies that she hates, I think Violet was a great protagonist. 2. (+) World-building - There isn't that much of a world-building per say--er, well, not in the typical paranormal sense; here, it's more of the historical scene (as evidenced by Ms. Harvey's letter to her readers about the 1870s being a time of great fascination with the spiritual world). Anyways, I enjoyed reading about the seances, the spiritual tricks, and the third eye techniques. Ms. Harvey says in that letter that she tried to make the world feel as realistic as possible, and it shows. 3. (+) Mother/Daughter Relationship - This, in my opinion, was one of the best parts to the book. It was an excellent example of why Violet felt so constrained; she was trapped in the confines of Victorian society wherever she looked--whether it be via an abusive fraud of a mother who wants to recapture her youth, being from the poor class, or due to typical Victorian standards. I think the Mother could have ended up being a stock character if not done well, but Ms. Harvey definitely portrayed the Mother's bitterness in a way that made her feel real. 4. (+) The Romance - Collin/Violet is a nice pairing. I really liked the description of their first kiss, thought that scene was really well written. I enjoyed seeing their relationship go from being almost childish (the jealousy, at least. Collin calls Xavier, Violet's other gentleman, 'prince') to friends to good friends who like each to Violet realizing that he's always been there for her, etc. Did not enjoy the Xavier scenes and given my complaint in #6 (and sort of in #8), I wonder if it needed to be included. Violet gets judged by society and not only by him so he's sort of just icing on the cake, you know? 5. (+) Villain(s?) - Definitely didn't see that one coming. I put the question mark because the mother is also a sort of villain. So all in all, Ms. Harvey sets up the antagonists really well. 6. (+/-) Character Cast - There are so many characters to this novel that I officially lost track of them all. Who was staying with Jasper and who was going? Or did they all stay with him? Or did they only come for the seances? I mean yes, this did provide some suspense as to who the killer actually was, but it would've been nice to settle down with less characters & have them be more developed. Right now, it's a neutral because I really like Elizabeth, who provided great comic relief and showed how judgmental the Victorian society could be, and Collin. And I don't like the Mom, but I do think that she was rather well developed. But everybody else feels wish-washy to me. 7. (+) The Writing - At the same time, the writing was done well; it was really easy to slip into Violet's world (the only exception being the small excerpts where Rowena is showing Violet something). There were a few words I didn't understand - maybe they were just British English? because I'd never heard of things like bellows before. 8. (--) Prologue - This is a picky complaint given that I just praised the writing, but this also has to do with a complaint on pacing. Anyways, I thought the prologue was unnecessary. One, you get to see Violet, her mom, and Collin doing their "magic" later anyways so introducing it can't be the main focus. Two, you could just say in the first chapter that the reason they moved from Cheapside was because of the money they had earned swindling those old ladies. Actually, I'm pretty sure it does still say that elsewhere. All in all, the prologue just seemed to me to be another example that I found where there was too many unnecessary details. 9. (+) The Idea - It felt oddly appropriate that the girl whose mother is a fraud would end up with the talent and have to use it to make her means. Like recompense for everything her mother had done though Violet hated the Spiritualist business.... Also, love that this is set in an older London age and still satirizes the way society then acted (i.e. the fact that Violet was in her underwear when she caught the murderer) without it being the typical Victorian woman-strives-for-power sort of deal... because Violet and her mother are pretty influential, it also sets up a nice contrast against the trivialities that the other women twitter about. 10. (--) The Cover - There's not much visually wrong with this cover... but I can tell you that I wouldn't pick it up. 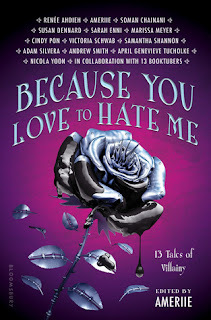 I don't like the tagline "Violet doesn't believe in ghosts, but they believe in her" nor do I like the pink author name on the purple cover. Yeah, yeah that's really picky, I know. And while I understand that the girl is supposed to be pale and deathly white, it still doesn't call to me. This cover isn't... stunning. I haven't heard of this book until now but it sounds like something I would like! Also, I love how you list the likes/dislike. Great review. I love that you list your 10 likes/dislikes! Such a great idea! Thanks for the review and for stopping by my blog. 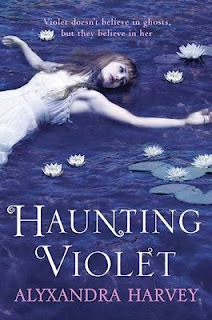 I also enjoyed Haunting Violet, yet the strange thing is I don't normally enjoy books with ghosts in them. I think I enjoyed this one as the ghosts really did have a proper purpose and there was a sense of urgency about their message. The book was also told in what I considered a realistic manner, it wasn't "away with the fairies" Violet didn't lead a charmed life, she had it rough, she'd had to pick pocket to just survive and eat. Her relationship with her mother and her fear of her mother using her for her ability. It was also ironic that violet could achieve the one thing her mother pretended that she could in speaking to those that had passed over. I=On the whole I really enjoyed this book a lot and to be totally truthful I had just bought it on a bit of a whim, feeling drawn to the cover more than anything and then being drawn to the irony aspect of the book.